The combo picture shows North Korean leader Kim Jong-un (L) and US President Donald Trump. Changi Airport. Southeast Asian island country(ANN)-US President Donald Trump and North Korean leader Kim Jong-un have arrived in Singapore, two days ahead of a much-anticipated summit that could ultimately resolve a persisting crisis in the Korean Peninsula over the North’s controversial nuclear and ballistic missile programs. 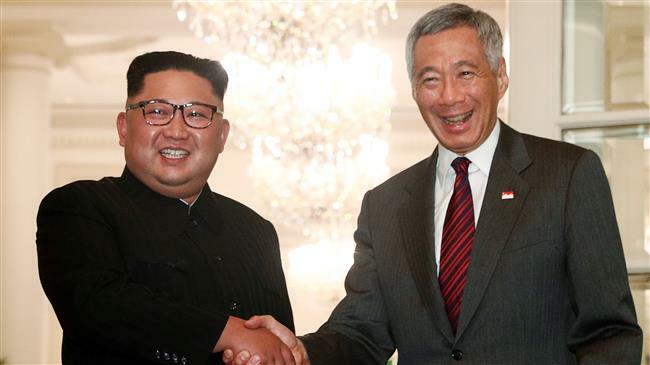 Singapore’s Minister for Foreign Affairs Vivian Balakrishnan said in a Twitter posting on Sunday that he had welcomed “Chairman Kim Jong-un who has just arrived in” the Southeast Asian island country. Kim was also welcomed by the country’s Prime Minister Lee Hsien Loong at Istana, the official residence and office of the president of Singapore. Singapore’s Straits Times also reported that the North’s leader, wearing glasses and a dark Maoist suit, arrived in an Air China 747 that touched down at Changi Airport. Kim was accompanied by his top officials, including Foreign Minister Ri Yong Ho and Kim Yong Chol, a close aide of Kim’s, who has been instrumental in the overture that has led to the Tuesday summit. The Flightradar24, a flight tracking website, also said that Kim’s plane took a mostly inland route while flying over China, where Kim has already visited twice. Shortly after landing, Kim said Singapore’s role would be recorded in history if the summit was a success. The North Korean leader is scheduled to meet with the US president at the Capella Hotel in Sentosa, an island resort off Singapore’s southern coast, at 9 a.m. local time on Tuesday, and to leave the island country at 2 p.m. local time the same day. Meanwhile, Trump flew into Singapore’s Paya Lebar Air Base aboard Air Force One a few hours after Kim’s arrival for the high-stakes summit. Trump also hoped that the meeting, which he described as “this one-time opportunity” would not be wasted. Pyongyang has agreed with the denuclearization of the Korean Peninsula, including both the North and South, rejecting the idea of giving up its arsenal unilaterally. While the summit is perceived as a test for diplomacy that could resolve the crisis, the stakes are high if it does not lead to any progress on limiting the North’s nuclear capabilities. 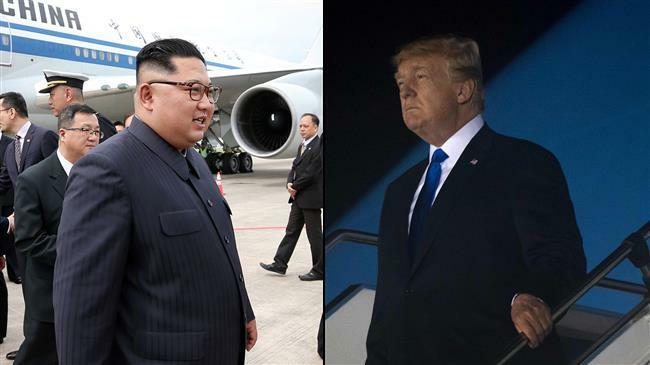 Experts say the talks could run into trouble since the US and North Korea hold different understandings of what it means for the latter to denuclearize. policy experts are especially worried about the possibility of war since Trump’s hawkish National Security Adviser John Bolton has previously made a case for preemptive strikes against North Korea. Bolton has suggested that the White House should consider the 2003-2004 “Libya model” in dealing with Pyongyang. That means the North must denuclearize first before the US would make any concessions. The North has already expressed willingness to denuclearize, but it will not do so if the US insists on it without any reciprocal commitment, experts say. On Wednesday, Russian President Vladimir Putin, while praising the historic meeting, said North Korea would want to receive “absolute security guarantees” to discard its nuclear program. However, the White House has so far failed to give North Korea the guarantee of its security, which is Pyongyang’s main demand.